So I pulled out all the first aid stuff I’d purchased a while back (note: my Master Kit was already done- or at least as “done” as it’s going to be for a while- but I pulled it out just for referencing… hence it is in the pictures as well) and just started filling up the car kits. I divided the supplies pretty equally between Hubby’s kit and mine, but certain things were more applicable to certain kits. For example, I put children’s medicines in my kit but not in Hubby’s because the kids are almost always in my car, but I put Tums in Hubby’s kit and not mine because he’s more likely to need that while out and about versus me who is usually at home. So I did a little customization of the car kits based on the needs of who is usually in each vehicle. All in all, I’m pretty happy with them at this point. Eventually I would like to add additional items (like instant ice packs, more medicines, etc) to bring them up to a more complete intermediate level, but they will do for now. It’s a good starting point. Alright. Do we all have our first aid kit containers? Good! Well next we need to fill them. 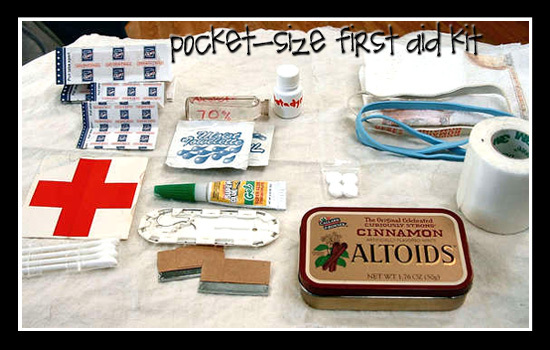 There are SO many options to choose from when stocking a first aid kit. You can just stand in a medicine aisle at the store to realize the plethora of options available. So, what to choose? Is it all important? Yes and no. Obviously everything has a time and a place. Here’s my suggestion. When you first start to fill your kit, start basic and then work your way up to an ultimate first-aid kit. You don’t have to have the whole ‘medicine aisle’ in your kit right at the start, but it doesn’t hurt to add more and more as you have the money and first-aid know-how. Alrightythen! Did this list just give anyone a heart attack? I hope you know CPR! 😀 Okay, well just remember… one step at a time. Start Basic. Then gradually build up to the Intermediate level. And then move on to your Ultimate First Aid Kit. It’s not as bad as you think. You probably have a lot of this stuff already lying around your house. Just gather it together so you’ve got a kit ready for any emergency. Check your kit every 6 months to 1 year to change out any expired medications and restock any items that have been used and not yet been replaced. If you have children or people with special needs/medical conditions, add any extra items that are appropriate to your situation. Make sure everything is properly labeled. Keep an inventory of everything that is in your kit and keep it inside your kit so you can take a quick glance at your list and know if you do or do not have a certain item. You may want to have a medical consent form and a medical history form for each member of your family and keep it with your kit. And finally, if you have any old cell phones, do not throw them away. Instead, charge the phone up, turn it off, and stick it in your first aid kit. Even if your phone is no longer connected to a service plan, it can still dial 9-1-1 and reach the local authorities! This would be especially helpful in a car kit or boat… someplace where you may not have ready access to a landline. Please remember, having a fully stocked first aid kit does not make you an expert in first aid. You should not perform first aid on someone if you do not know what you are doing. Not only could you make the problem worse, but you could be sued for performing any aid above the level you are certified (sad, but true). That being said, let’s not have ignorance as an excuse. Let’s learn some first aid! We’ll start tackling basic first aid techniques in the upcoming months. If there is anything specific you would like to learn, just let me know. However, if you REALLY want to be proficient at it (not to mention certified), I would recommend taking a first aid class. Until then, healthy wishes to you all! This is such a great idea! It’s a pocket-sized first aid kit for your purse or… pocket. 🙂 Very handy and very creative. I definitely think I’ll have to make one for my purse. Right now all my band-aids and what not that I keep in my purse are just in a resealable baggie and it’s getting beat up. I think this would be a much better option. 🙂 Obviously you can customize what you want to put in the kit, but the recommendations in the tutorial are a good place to start (click link below for tutorial). Enjoy and have a happy weekend! 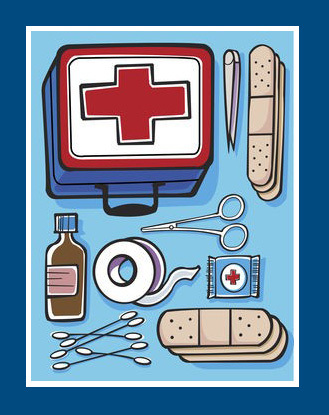 Having a well stocked first aid kit is a key element to successful emergency preparedness. You should keep a first aid kit in your home and in your car(s) so that you can be prepared wherever you go. Two of the main keys to a good kit are functionality and organization. If you can’t find what you need when you need it, your kit will end up being more of a frustration than a help. So the first thing we need is a good container for our kit. It can be as simple as a plastic resealable baggie to an elaborate organization box. Whatever you choose, make sure your container fits the needs of the kit. A plastic baggie could be good for a small kit such as one you’d keep in your purse, but you wouldn’t want to use it for your home kit since it wouldn’t be very organized nor sturdy. 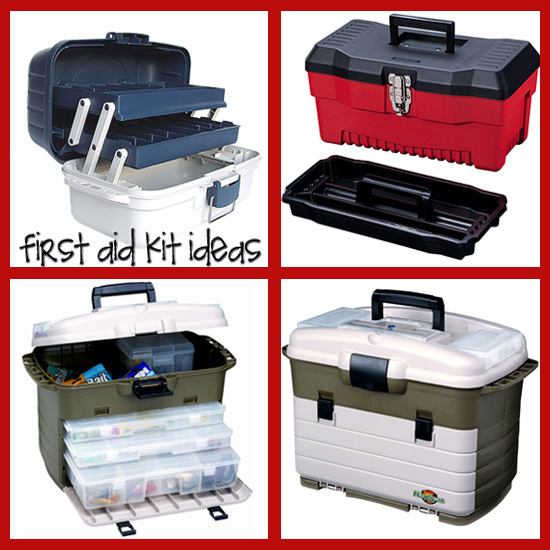 For a home and car kit, I like to use tackle or tool boxes because they’re sturdy and have lots of little compartments for lots of little things. Backpacks or small duffel bags would also work as long as you have a way to organize them inside. My athletic trainer kit was a simple plastic toolbox from Wal-mart (similar to the red one in the picture above). That one is going to become my car kit and I have now purchased a LARGE tackle box to use for my new ultimate first aid kit. (It’s the bottom two examples in the picture above.) What I really like about it (and trust me… I debated and evaluated many different kinds–just ask Hubby!) is that it has a large main compartment for larger pieces of equipment (like Hubby’s stethoscope and blood pressure cuff, and other bigger items), and then what really sold me is the plastic boxes that stack up on bottom. Many different tackle boxes had this style, but this was the only one I found that had a large (tall and deep) plastic box in addition to the thinner boxes. The thinner boxes all have small spaces for storing things, which is fine for a lot of the first aid stuff, but I was also needing some more larger spaces for things like Ace bandages, medical tape, etc. which is what the deep box has. Anyway, the point is that it fit my needs perfectly and so I got it (perhaps a bit hastily, since I just found it online today for about $25 less than where I got it… but I have it nonetheless!) 🙂 If any of you are interested in it, the brand is Flambeau and you can find it HERE (for the $25 less price). So anyway, our goal this week is to get a kit container that will meet your family’s needs. (Remember that you do not have to purchase this. You may already have something around your house that would work!) But my recommendation is that, even if you have no supplies at all yet, you go ahead and choose a container that will suit your ultimate needs so that a year down the road you don’t have to get a new kit when you run out of room in your smaller one. And if you’ve already got your home kit well-stocked, get a container for each of your cars. Either way, let’s get ready to start stocking!